In suburban Buenos Aires, thirty unemployed auto-parts workers walk into their idle factory, roll out sleeping mats and refuse to leave. All they want is to re-start the silent machines. 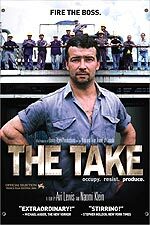 But this simple act - "the take" - threatens to turn the globalization debate on its head. In the wake of Argentina's spectacular economic collapse in 2001, Latin America's most prosperous middle class finds itself in a ghost town of abandoned factories and mass unemployment. The Forja San Martin auto plant had been dormant until its former employees take action. They're part of a daring new movement of workers who are occupying bankrupt businesses and creating jobs in the ruins of the failed system. The story of the workers' struggle is set against the dramatic backdrop of a crucial presidential election in Argentina, in which the architect of the economic collapse, Carlos Menem, is the front-runner. His cronies, the former factory owners, are circling; if he wins, they'll take back the companies that the movement has worked so hard to revive. Armed only with slingshots and an abiding faith in shop-floor democracy, the workers face off against the bosses, bankers, and a legal system that sees their beloved factories as nothing more than scrap metal for sale. In THE TAKE, director Avi Lewis and writer Naomi Klein (author of the international best-seller, No Logo) combine the stories of the workers and their families, stories of their struggle for jobs and dignity, with comments from factory owners, politicians and judges, and an examination of the macro-economic policies of globalization. The result is a compelling political thriller that pits ordinary workers against the local ruling elite and the powerful forces of global capitalism. Amid the current debates over globalization, THE TAKE champions a humane economic manifesto for the 21st century.